Cinnyr, the Golden City, is a massive urban settlement suspended between two great lakes, cascading into one another from a high cliff. The eastern shore, and most of the city itself, is raised 50 feet above the water level at Lake Kylon, with massive steam-powered lifts helping to carry folk and cargo alike up from the lower roads along the cliffside, the Dragon's Spine. The exact date the city was founded is unclear, but the marvel of engineering that has allowed the water of Lake Eilon to flow freely in canals across the entire city non-stop for 500 years, granting the city nearly limitless energy and powering its industry, has made the city the foremost destination for businessmen and commonfolk alike. The city is a safe haven for all races and all religions, and is (compared to most other places) low in crime, and no matter the day or time, there's always something interesting happening in one of the city's many districts. A district filled with markets, selling everything from common goods to high end wares along the Golden Lane, the main street lit with lamps that grant the district its name. Many guilds have a hall in this district, and each are competing for the business of anyone who happens to pass by. Additionally, the main branch of the Bank of Tal Sol is located here, allowing individuals to invest and store their funds as they please. The seedy entertainment district; home to several art houses, stage production companies, and haven for less desirable businesses and people alike. An easy place for bards and performers of all kinds to let their creativities run wild, and a hot spot for festivals and celebrations of events you've never heard of. A massive park that holds various cemeteries and memorial sites. The vast hill rises almost to the cliffside wall, and it is said that one might convene with the spirits who dwell there on moonless nights. The surrounding neighborhoods are also home to a small community of outsider races, such as tieflings and dragonborn, who tend to set themselves aside from the main population. A respectable human district mostly consisting of middle class subdivisions and small neighborhood markets. Individuals with enough coin and a silver tongue can easily acquire living space, either to own themselves or to rent out, generating further funds over time. The oldest part of the city, as the name might imply, filled with modest houses, shops, and temples to the gods. The buildings and homes in this area are not quite decrepit, but many have fallen into disrepair over the years. The Ring of Spears hosts gladiatorial bouts that draw viewers from across the city. A neighborhood that is well known for its sprawling gardens and natural pathways, inhabited mostly by elves at peace with their surroundings. Near the city wall exists an unkempt redleaf forest, home to strange creatures and stranger individuals. Though it flows through Cinderwick to arrive there, the water in Elora Pond is remarkably crystal clear. A large industrial district on the city's waterfront. Inhabited almost exclusively by gnomish and dwarvish engineers and inventors, this area is filled with factories and laboratories alike, each housing an exciting new project. The denizens of Cinderwick are fiercely protective of their own ideas, and extremely curious about their competitor's, so there are almost always job opportunities for spies, thieves, and bodyguards in this district. A neighborhood of burrowed homes suitable for the Halfling residents who live there. A quiet district that typically warrants no visitors, since people who find themselves in Burrowbank unwelcome or uninvited rarely make a return trip. However, those that make the journey and manage to earn the halfling's favor will find warm hearths, fine brews, and delicious food waiting for them. A rough district largely composed of sailors and ex-cons. Lake Eilon, also known as the Sapphire Lake, filters out into the Eastern Sea, so the ports of Pitchwood often deliver all types of strange folk, but only the most down-on-their-luck typically stay there. Much of the cargo bound for sale in Candlestreet arrives here, and certain folk are willing to pay a decent wage to ensure it makes it there safely. The Rookery is home to most of Cinnyr’s finest educational institutions, many of which specialize in the arcane arts. Whatever it is you wish to learn, most scholars agree that if the Rookery can’t help you, nobody can - and it probably wasn't worth learning about anyway. Tuition to these schools is expensive, but the fine educators here often grant scholarships to those who display good work ethic. A more run-down part of the city, home to many roguish figures looking for easy targets coming and going from the Inner City, or trying to gain entry themselves. Sumpton also features several less than reputable wizards and warlocks barred from the Rookery, attempting to peddle their wares or pass their knowledge on to anyone with enough gold. The Inner City can only be entered by those who have proven themselves to be worthy in the eyes of Parliament, were born into a family who has already done so, or are rich enough to convince the government otherwise. Other than the more upscale flair, not much resides in this part of the city that cannot be gotten elsewhere, but the mysterious allure still sends many people to Saltside Prison each week on trespassing charges. Keep Sel Uthali houses Parliament and the Tower of the Inquisition, responsible for the governing of the city and the interrogation of its enemies respectively. Though it mostly consists of overflow from Sumpton, the Conclave is known for its deeply religious leaders and is welcoming of folk of all races and all walks of life. Many deities whose shrines are absent from the Godswalk, often due to their requirements of sacrifice or subjugation, find their worshipers holed up within the Conclave due to the freedoms granted there. Some of these religious extremists are welcoming of new recruits into their temples, but most are just looking for a sample of your blood to help call upon their foul god. An upscale merchant’s district, commonly visited by patrons from the Inner City. Most vendors and craftsmen here deal in higher end wares, such as silks and imported spices, and the district is filled with warehouses that store there. Some even deal in lucrative businesses such as information, slave trading, or the infusion of blood magic into magical items – an art forgotten and forbidden by all but those within the Bureau. These services command absolute discretion and an absurd price tag. Saltside district’s name is poison on the lips of most Cinnyrians due to its housing of the Saltside Prison. Apart from this most important feature, Saltside is home to several large companies, several of whom have deals with Parliament in order to parole prisoners into labor for them at a cheap cost. The large docks and factories in Saltside are almost entirely employed by these prisoners; it is an unpleasant place to be at all hours of the day. But, if one is looking to hire tough men for a special task, or is attempting to start a business on the cheap side, Saltside should be the first place on their list. The only major settlement outside of the city walls. Mead’s End is home to the poorest of the poor; those who cannot afford a home within the walls, or whose business has been run out of town, end up in this sorry area. However, it is not without its perks – denizens of Mead’s End are willing to part with any information they may have gleaned or any item they can steal for the right amount of coin, and the taverns in the humble district are well known for their incredibly powerful ales. 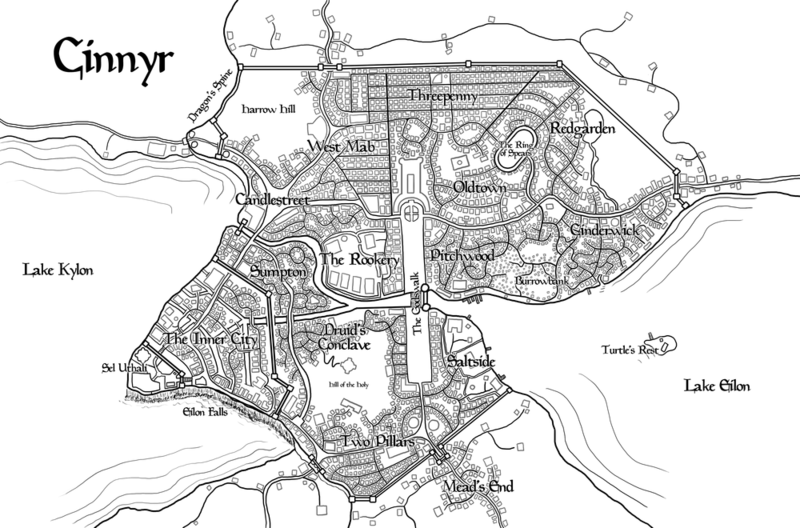 The Godswalk is a massively long bazaar that stretches from one end of the city to another, beginning across the canal near Saltside and ending with a plaza at its north side, featuring an enormous fountain. It holds shrines dedicated to every recognized good deity, and is packed full of people at all hours, praying to their gods and taking in the sights. The golden plaza is under constant surveillance by dozens of armed guards, but it has supposedly been years since any crime has occurred in this holy place.